San Diego is such a beautiful city with so much to see and so much to do! San Diego in January is ripe with new beginnings for the New Year. 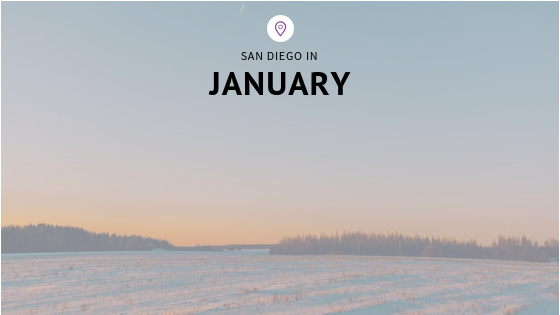 California’s southernmost big city boasts January weather that’s almost like a dream, with moderate temperatures and clear skies. According to TripSavvy, in January, the number of tourists in town drops to half of its mid-summer level, leaving you plenty of room no matter where you go. 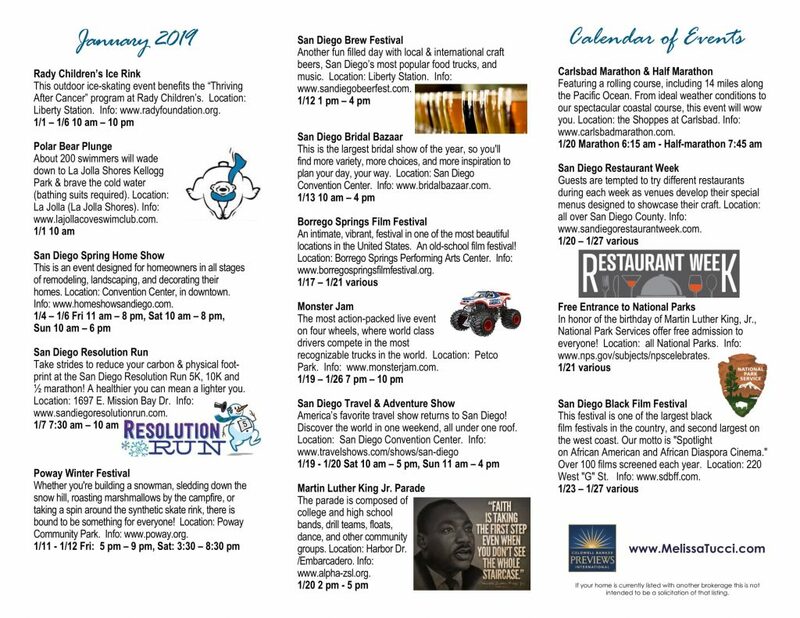 Each month I have special fun events I want to show you so that you get the most out of this beautiful city! This outdoor ice-skating event benefits the “Thriving After Cancer” program at Rady Children’s. Location: Liberty Station. Info: www.radyfoundation.org. About 200 swimmers will wade down to La Jolla Shores Kellogg Park & brave the cold water (bathing suits required). Location: La Jolla (La Jolla Shores). Info: www.lajollacoveswimclub.com. This is an event designed for homeowners in all stages of remodeling, landscaping, and decorating their homes. Location: Convention Center, in downtown. Info: www.homeshowsandiego.com. Take strides to reduce your carbon & physical foot- print at the San Diego Resolution Run 5K, 10K and 1⁄2 marathon! A healthier you can mean a lighter you. Location: 1697 E. Mission Bay Dr. Info: www.sandiegoresolutionrun.com. Whether you’re building a snowman, sledding down the snow hill, roasting marshmallows by the campfire, or taking a spin around the synthetic skate rink, there is bound to be something for everyone! Location: Poway Community Park. Info: www.poway.org. For more events check out the info below. 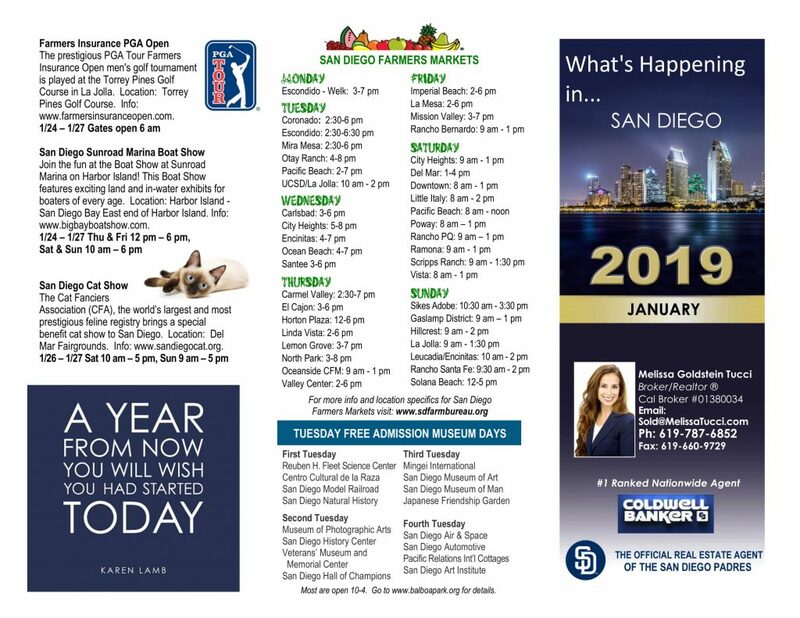 The prestigious PGA Tour Farmers Insurance Open men’s golf tournament is played at the Torrey Pines Golf Course in La Jolla. Location: Torrey Pines Golf Course. Info: www.farmersinsuranceopen.com. Join the fun at the Boat Show at Sunroad Marina on Harbor Island! This Boat Show features exciting land and in-water exhibits for boaters of every age. Association (CFA), the world’s largest and most prestigious feline registry brings a special benefit cat show to San Diego. If you want to see a home sometime this month, check out all my Featured Listings, and message me.